Last edited by Josa on November 6th, 2017, 1:56 pm, edited 1 time in total. Lurtz wrote: It happens on both an Intel HD 520 and a Radeon R9 390 on Windows 10 16299.19. It was worse, but after the fixes for the transparent rendering errors landed, it is better again, but still happening sometimes. Yeah, It happened again on the newest build, no idea what triggers it. I do not remember it happening on Windows 7 (used a few days ago). Maybe it is something related to Radeon & Win10. Wouldn't know. There's definitely something going on with VP9 decode. Nightly is using double the CPU power than good builds at every quality level. Surprisingly I've been able to leave WebRender enabled for a few days without any crashes or severe issues. Performance is still a bit rough in some areas and the startup time is pretty bad... but it's much better than it was a few weeks ago. Something's definitely off with VP9. Drops frames like crazy every few seconds. Maybe something to do with Media Cache off main thread? sciguyryan wrote: Surprisingly I've been able to leave WebRender enabled for a few days without any crashes or severe issues. Performance is still a bit rough in some areas and the startup time is pretty bad... but it's much better than it was a few weeks ago. If scrolling performance would be en par with D3D11 Advanced Layers I would consider enabling it by default. Lurtz wrote: My thoughts exactly! It's interesting that you say that because I'm noticing times where scrolling performance is better with WebRender and Retain Display Lists enabled. The issue I see is consistency, some sites are awful, some are amazing. Still, not too shabby for a pre-alpha build. Tried it again just now, the performance seems better than what it used to be, but I really fail to see the big difference between pre-webrender and webrender currently. The scrolling performance on the other hand has gotten better now compared to how it was on Webrender not long ago. The broken font anti-aliasing still plagues it. If you open up a screenshot and zoom in till you clearly see the pixels, you see that the fonts are anti-aliased in a BGR fashion (or so) instead of RGB. That is the reason for the blurry text. It should however be a very easy fix and I am pretty sure it is on their list. Are there known problems with webrenderer of nightly on MacOS? I've seen scrolling lag when playing video on a website. Or I should not enable webrenderer for MacOS? Wasn't the blurred RGB font problem fixed just a few days ago in WebRender?! Didn't that land in Nightly yet? I thought Nightly was broken, but after trying Beta and Release with the same results, rebooting the modem, rebooting the PC, making sure the anti-virus is absolute current, checking most recent virus scan, it appears that the problem isn't Nightly. Comcast is having backbone and DNS issues today that is affecting all "non-local" sites. According to http://downdetector.com/status/comcast-xfinity the issues started about 1:04am EST. ETA: backbone -> DNS (in bold area above) Nope, make that backbone and DNS issues. ETA (12:19pm PST): The problem appears to be easing up some, but some areas are still reporting outages. Last edited by Mark12547 on November 6th, 2017, 1:53 pm, edited 5 times in total. 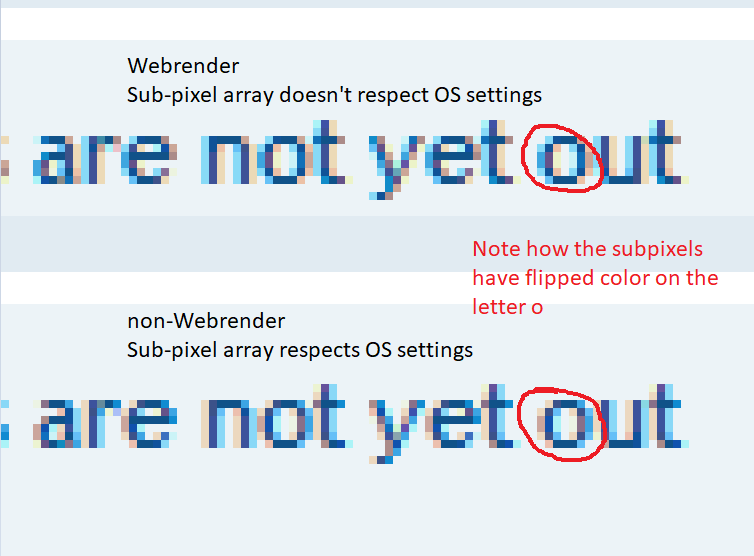 Lurtz wrote: Wasn't the blurred RGB font problem fixed just a few days ago in WebRender?! Didn't that land in Nightly yet? They just reopened that bug. Yeah, the Comcast issues hit just as I was reconfiguring the routers in my house. i was going crazy trying to get back to a stable environment before I realized the problem was outside my control.